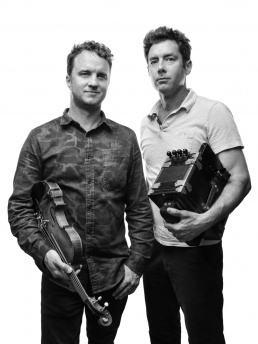 Andre and Louis Michot began playing Cajun Music as teenagers with their father and uncles as Les Frères Michot in the 1990s, and by 1999 had begun their own band, Lost Bayou Ramblers. After 20 years of touring and 10 albums under their belt, the outfit was awarded a Grammy for their 2017 release, Kalenda, for Best Regional Roots Album. 2012 brought LBR’s score contribution to the Caméra D’Or winning, and Oscar nominated film Beasts Of The Southern Wild, along with a string of live orchestra performances across the country. In 2016, the band’s performance and recording session on the same microphone and wax lathe that recorded the very first Cajun recording (as well as Louis Armstrong’s first recording) was produced by Jack White for American Epic, where LBR was featured along side artists like Willie Nelson, Alabama Shakes, and Elton John. The 2019 release of ‘On Va Continuer’, a documentary about the band, will give Lost Bayou Ramblers’ fans an inside look on the daily lives of the band members, and seeks to help answer the eminent question of where Louisiana French is headed in the 21st century.